After the Sabbath the women make their way to Jesus' tomb to lovingly finish their obligations toward their Lord. 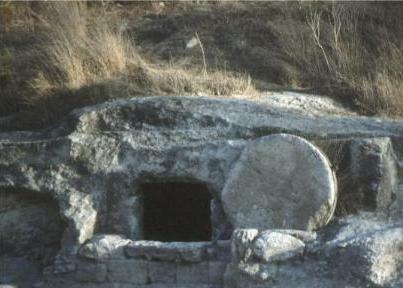 In haste, they could not complete the anointing of Jesus' body before burial. Now that the Sabbath is over, they make their way toward the tomb, just after sunrise, to do just that. Their main concern is who will assist them in removing the massive stone that has sealed Jesus' body in its burial cave. The male disciples remain in hiding, either nowhere to be found, or they simply refuse to put themselves at risk by venturing out into the light of day. To their shock the women discover that the stone, for some unknown reason, has been moved. The entrance to Jesus' grave is open. Creating a sense of fear they encounter a "young man" dressed in white. They are not prepared to meet the living in a place reserved only for the dead. They then receive the bewildering and unbelievably incredible news. Jesus is no longer in the grave because he is no longer among the dead. He has risen. The "young man" then gives the women a message to his disciples and Peter. Why is Peter singled out separately from the rest? Could it be that, because of his denial, Peter is, for the moment, out of the band of men who had followed Jesus? Could it more likely be that in mentioning him by name, the "young man" hopes to comfort Peter in the knowledge that his Lord still wants something to do with him, even though he had denied publicly he wanted anything to do with the Lord? "He is going ahead of you into Galilee. There you will see him, just as he told you." That is the message to the disciples. "He is going out ahead of you." The disciples could not keep up with Jesus in life, and now he has gone out ahead of them into new life. Not even death could slow Jesus down. The Lion of the Tribe of Judah cannot be tamed. Instead, Jesus has tamed the Principalities and Powers. Jesus has entered into the jaws of death itself and pulled its teeth. As he entered into death and has now emerged out the other side into new life, Jesus remains on the move. All the disciples can do is follow him doing their best to keep up. All they can do is obey the command of the "young man"... Go and tell.